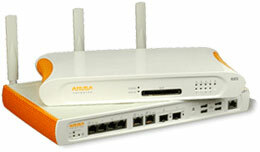 The Aruba 600 Series has been discontinued. No direct replacement is available. The Aruba 600 Series mobility controllers provide local wireless services when used in conjunction with any Aruba access point (AP), or they can operate as wired-only devices. They also feature print server and network-attached storage capabilities for local network printing and mass storage.Aruba's centralized configuration and management model enables the 600 Series to be deployed, monitored and controlled without any local IT staff. Deployment options include zero-touch remote management or local configuration via a web interface.